This story started back about 5 years ago. My boss, Steve Martin, asked me to go hunting with him in the Wasatch unit of Utah. Of course I didn’t have a tag and would be on his hunt with him mainly for moral support. We saw a lot of country and a lot of great bulls. 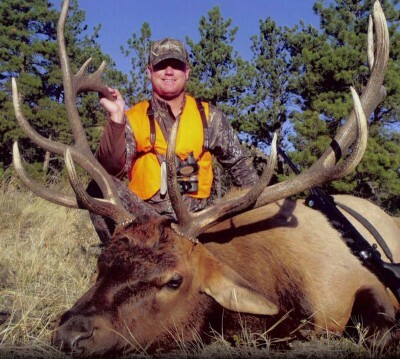 Steve harvested a 351” bull on the fifth day, and I immediately caught the elk bug. Steve recommended that I subscribe to The Huntin’ Fool magazine and follow the advice listed by the Carters and staff. I did, and the application process began. Going into 2011 I had 5 points in all of the western states for almost all species available, I called Jeff Warren of The Huntin’ Fool and asked him if 5 points would get me a good tag for 2011. Jeff recommended that I apply in Wyoming for a unit 7 type 1 elk tag, and if I drew, he recommended that I go hunting with Dax McCarty and Wagonhound Outfitters located outside of Douglas, Wyoming. I followed Jeff’s advice, drew the tag and then booked the hunt with Wagonhound for the opening day of rifle season. Hardly any of us Mississippi boys have ever harvested an elk, let alone had the opportunity to taste elk. It is for this reason that I decided to drive out to Wyoming, so that I could easily transport the elk meat back home myself if I was lucky enough to take a bull. I asked a couple of my friends to accompany me on my trip, but no one would commit, so I left Hattiesburg, Mississippi heading to Douglas early in the morning on October 5th all by myself. It would take me 1,657 miles and 2 ½ days, but I finally arrived at Wagonhound’s mountain camp just after noon on Friday the 7th. There were four hunters in camp for the week, and we all arrived at the same time. Introductions were made, luggage and gear were unloaded, and we all headed to the rifle range to ensure our rifles were still zeroed. After a few rounds were fired I glanced across the valley from the lodge and saw a huge herd of elk running up the other side. There must have been 140 head with several good looking bulls in the mix. Man was I excited! That evening my guide, Dax McCarty, who happened to be the outfitter, and I went glassing. We saw several good bulls and covered a lot of country. The Wagonhound Ranch consists of 170,000 acres of rolling prairie to the east and High Mountain peaks to the west. There were elk, Mule deer, Whitetail deer, and antelope everywhere. It was truly a hunter’s paradise. We were up at 5 am the next morning. It was warm out with a south wind and a full moon, but my excitement level had never been higher. Dax and I started up the mountain. Within 5 minutes of leaving the lodge we spotted a small herd of elk with a good looking bull. Dax put his Swarovski spotting scope on the bull and said that the big bull was worth hiking up the mountain to get a better look at. I’m in pretty good shape. I workout 5 days a week, 52 weeks of the year. However, my house is situated at 236’ above sea level, and we were hiking straight up a hill somewhere around 8,000’ above sea level. The more we walked, the more my lungs burned. I struggled and struggled, but I was finally able to reach the top of the hill. We saw the big bull atop a hill at 500 yards away, but I was still breathing so hard that I couldn’t even hold my Swarovski EL’s steady enough to see how good he was. We took a 5 minute break; I caught my breath, and then we started back on the stalk. We sidehilled the next 500 yards and because we were now in the super sneak mode, I was able to keep up with Dax and my breathing. We topped a small ridge and could see some small bulls. We ducked below the ridge, and with a perfect wind, we moved up another 100 yards. When we topped the ridge again the small bulls were at about 60 yards. We waited about 5 minutes without seeing the big bull. All of a sudden a smaller bull that we hadn’t seen yet was staring us down at about 40 yards. The small guy turned and bolted, and when he did three of for small bulls took off after him. I had my gun in a “Trigger Stick” and was ready. Finally the big bull emerged from the timber. This bull dwarfed the other bulls, and I asked Dax if the bull was big enough, to which Dax simply replied, “Yes!” I squeezed the trigger of my custom built .300 WSM, and the 168 grain Berger VLD bullet hit the big bull directly in the shoulder. He dropped in his tracks. Words cannot accurately describe the wave of emotions tat swept over me. I thought back to all of the years applying, all of the hunts I had read about with envy in The Huntin’ Fool, all of the wind sprints I had run, the endless hours of shooting my rifle, all of the gear I had gathered in anticipation of such a hunt, and the long, hard drive it took to get from Mississippi to Wyoming. It was all worth it for I had truly harvested a great animal! We walked up on the big bull, and Dax immediately exclaimed how big the old bull was. I thought that was special since Dax sees these animals every day. We took a lot of pictures and truly soaked up the moment. We soon realized the the big bull was laying the middle of an old road. Dax thought that he could get his four-wheel drive Chevy all the way up the mountain to the downed bull. It was at that point that I looked down at the truck. It looked like an ant! We had hiked about 2,000’ in 25 minutes. No wonder my lungs were on fire! Soon enough we had the big bull loaded and at the processor. Even the processor said the bull was huge! The next day and a half was spent taking pictures, seeing the country, and spotting for other hunters. All four of the hunters in camp harvested great animals. The hunt was a total success. We had great accommodations, great food, great comradery, great guides, great country, and even greater animals to hunt. I can’t wait to get back out West!